Can you give me a meal plan? If you’re like most registered dietitians, you’re asked to provide meal plans by your clients. Of course, it’s friends and family, too! This article features insight from RDs that use custom meal planning tools in their practice. They share why they chose the tool, how they monetize the meal plans, and what they’ve learned along the way. The truth is that clients often seek out our expertise with the goal that we will tell them what to eat. At a minimum, they want ample suggestions for recipes and meals. However, meal plans are time consuming to create. Not to mention, balancing food allergies, preferences and nutrient prescriptions makes creating custom meal plans difficult. Meal planning tools for professionals offer a solution. They streamline the process of creating meal plans by providing access to a database of recipes and tools like grocery lists to share with clients. Having easy access to generating custom meal plans can add value for your clients as well as your business. However, navigating the options can be difficult. From the ability to customize plans based on lists of allergies and food preferences, to macronutrient prescriptions and available recipe nutrient analysis, it can feel dizzying when considering the options. While a product demo and trial are valuable for making your decision, hearing insight from real users offers value you can’t obtain from the product’s website. What About Teaching Meal Planning? One common objection to providing meal plans is that clients don’t learn skills needed to independently plan meals. However, from the insight provided, you will see that meal plans are a teaching tool. Clients struggle with where and how to get started. A structured tool can help them on their journey. Recipe ideas provide a tangible example of how to incorporate more vegetables, or create a satisfying meal without an allergen. A meal plan can provide insight on portion sizes and frequency of consuming specific foods or groups of foods. As nutrition experts it’s easy to take our knowledge for granted. We forget how complex the task of choosing foods and planning meals can feel for clients. Meal plans are a tool in our toolbox of resources to help our clients. Amanda Sauceda, MS, RDN, CLT is a private practice owner specializing in food allergies/sensitivities and utilizes Living Plate Rx meal plans. Natalia Stasenko, MS, RDN is virtual practice owner and online course creator specializing in feeding and pediatric nutrition. She uses Meal Garden for meal plans. Basheerah Enahora, MBA, MS, RDN, LDN is a private practice owner specializing in mindful and holistic nutrition for women. She utilizes Living Plate Rx meal plans. Sarah Marjoram, MS, RDN, LD leads a digital content creation agency consulting with brands and businesses in the nutrition industry. She utilizes Living Plate Rx meal plans. Melissa Groves, RDN, LD is a virtual (and in-person) practice owner specializing in PCOS and fertility. She utilizes That Clean Life and Living Plate Rx meal plans. Chloe Schweinshaut RD, LDN, CLT is a private practice owner specializing in family friendly nutrition with a whole food and holistic approach. She utilizes That Clean Life for meal plans. Theresa Montmorency MS, RDN is a consultant for gym. She utilizes EatLove meal plans. Jenna Gorham, RD, LN works with food and wellness brands and offers Living Plate Rx meal plans. Leanne Ray, MS, RDN is a virtual practice owner specializing in practical nutrition for busy professionals and utilizes Living Plate Rx meal plans. What meal planning tool do you currently use for your clients and how long have you been utilizing it? What (if any) other options did you consider? Amanda Sauceda: I am currently using Living Plate Rx and have been using it in practice for over year. Living Plate stood out to me compared to other programs out there is the fact their meal plans are created by a dietitian and not computer generated. This was something unique. I also wanted something that was easy to use and visually appealing. Natalia Stasenko: I have been using the Meal Garden planning tool for the last year as a bonus feature for my online class and occasionally for my private clients. I considered a few other resources but Meal Garden was running a special promotion for health providers so I decided to try it out. Basheerah Enahora: I use Living Plate Rx and have been using it for about the past 6 months. Prior to Living Plate having its own platform, it was part of Gathered Table. I used that as well for about a year. The functionality was similar but not the same as the current platform. I looked at EatLove or continuing to use Food Processor, which I have a current license for. EatLove wasn’t robust enough, lacked flexibility and had a very limited database of recipes. I looked at EatLove when it was first launching over a year ago. I’m not sure if that has changed. Sarah Marjoram: Living Plate Rx and I have only recently started using it (6 months). I also looked at EatLove. Melissa Groves: I’ve been using That Clean Life for about a year, and I recently added Living Plate Rx to my practice. I played around with EatLove Pro and Living Plate, but neither of them fully met my needs, so I decided to go with That Clean Life for recipes plus Living Plate for clients who want something more structured. Chloe Schweinshaut: I use That Clean Life and have been using it for almost a year. I didn’t have an additional option that I was considering. I have a friend and fellow RD who had been using it (That Clean Life) and loved it and once she showed me all the features, I was sold. Theresa Montmorency: I currently use EatLove and I have been an EatLove member for one year. I found that you can find meal plans online quite easily. However, my clients were expecting individualized plans that are unique to their lifestyle. At FNCE two years ago, I spoke with the EatLove team and was fascinated with what they had to offer to RDs. Leanne Ray: I use Living Plate Rx and have been using it since May 2018 when I incorporated it into a 4-week cooking challenge that I hosted! I honestly didn’t do much research into other options. I was connected to Living Plate by a mutual friend of the founder and everything just kind of fell into place! I loved that it was created by RDs, for RDs (only dietitians can distribute the plans). I found it to be really user-friendly and functional and they are constantly adding new features. Jenna Gorham: I use Living Plate meal plans and have been using them for about 1 year. At the time, Living Plate was the only meal planning tool I knew of. I found it very user friendly and was instantly hooked. Since then, other meal planning companies have reached out to me asking me to try their meal plans. I haven’t found any others that are as easy to use or have a layout that I like. Amanda Sauceda: There were a couple aspects that I felt were most important. The first one being the team at Living Plate Rx. They’re team is amazing and very responsive to suggestions and questions. Secondly the cost couldn’t be beat. They are free to get started. Natalia Stasenko: The database, ability to add my own recipes and compile family meals out of a few recipes. I mostly work with families and many are looking for meal ideas that can be served family style and have simple starch options for more selective kids. The Meal Garden seemed a perfect choice for me. Basheerah Enahora: Ease of use, flexibility/functionality were most important for me in choosing a platform. I also wanted a platform that was supportive of its members and receptive of feedback for improvement. Living Plate still isn’t quite where I’d like it to be, but Jeanne continues to make improvements to the platform and provides resources and tools to members. She’s extremely responsive as well and I value that commitment to quality service. Sarah Marjoram: I mainly chose Living Plate because of how it is structured. It offers RDNs white label meal plans that they can customize for their business. They provide marketing materials and tools that equip us to leverage them in our own businesses. And they can serve as a passive income source if our clients subscribe. It was also important to me that the meal plans are curated by dietitians – not by computers. I think that elevates the value of the product and is a selling point. Melissa Groves: When it came down to it, I wanted a platform that had many recipes available for specific dietary considerations. I found with some of the other ones that once you removed dairy, gluten, or other allergens or intolerances, it didn’t leave many recipe options. Chloe Schweinshaut: For me, I primarily love the ease of implementation and the customization. I’m not a tech-savvy person and I find it incredibly user-friendly. The other thing that attracted me to this program were the foods that were offered. I consider myself a “real food RD” and I loved the menus that were created and the ingredients used. Theresa Montmorency: The ease of sending complete meal plans to clients and the flexibility to make a meal plan that is specific to each client. The nutrition prescription technology helps to decrease the amount of time I have to spend crunching numbers and are validated by dietitian experts for each medical condition. The speed of making meal plans is amazing. After I upload my client’s information in EatLove, it takes me less than 60 seconds to generate a perfect meal plan for them each week. The quality and quantity of recipes was another highlight when choosing EatLove. Their culinary team is constantly adding new recipes to the database. They test each recipe in house and adapt recipes for different diseases, tastes, and diets to meet all needs, even the most esoteric! Leanne Ray: The ease of use fits with my practice perfectly. My target market is busy professionals and because of this I strive to make everything as simple and convenient for the client as possible (i.e. e-forms, virtual sessions, communication via smartphone app, etc.). Living Plate has drag & drop capability and then you can easily print a shopping list based on your choices. Jenna Gorham: Ease of use, quality of recipes, and the ability to customize it and search from a database of recipes were all important to me. How do you utilize the meal planning tool in your practice? What monetization strategy do you use? Amanda Sauceda: I incorporate the meal plans into my packages and offer them a la carte on my website. The best way to monetize them is to incorporate them into packages and offer them as an added on bonus to make their life easier and bring my recommendations to life. I also started offering a service where I give a quick session with me plus a meal plan to give them strategy on how to best use the meal plan for their health goals and concerns. Natalia Stasenko: I do not monetize it at the moment but plan to at some point. 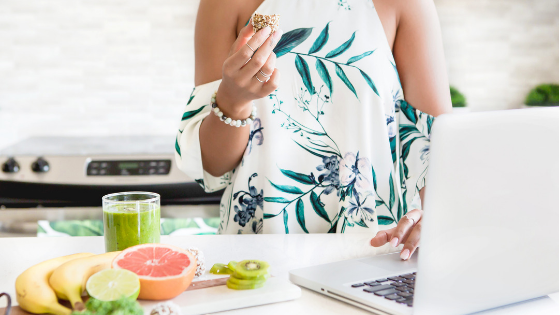 Right now, I am offering a free meal plan for my online class participants and they have an option to join the paid version of the website in order to keep using it. Basheerah Enahora: I include meal planning with my 12-session nutrition package. I technically eat the cost of the meal planning tool, but I’m also guaranteed that someone is going to work with me for 3 months, so it’s a worthwhile investment for me. For my insurance clients or self-pay clients who don’t sign up for my 12-session package, I still sign them up for a free trial and encourage them to use it for a few days to see how they like the platform. Most people like the platform and end up signing up. Sarah Marjoram: I no longer see clients and now work as a nutrition communications and marketing consultant. Where possible, I leverage the meal plans as lead magnets for consulting projects. They are a powerful marketing tool and add value to my clients at no additional cost to me. As a former private practice owner, I also love knowing that I can provide consumers with something that facilitates healthy eating habits. The meal plans allow me to have an impact on individuals even after I have shifted my business to a different model. Melissa Groves: I use That Clean Life to provide recipes for my clients based on what we’re working on. For example, if we’re working on adding more protein at breakfast, I’ll send them 20 high-protein breakfast ideas. It takes me 5 minutes and makes me look like a rockstar to my clients. They really appreciate the extra support and the recipes are mostly quick and easy and taste delicious. I do not charge clients for this service; it’s folded into the cost of my nutrition counseling packages. I find that most people are unwilling to follow a structured meal plan, but if I do have clients that want that guidance, I sign them up with Living Plate, which I am an affiliate for, meaning I get a small percentage from every client I refer. I also recently made a lead magnet using a meal plan, which took me less than an hour, and grew my list by 200 people in just 6 days. Chloe Schweinshaut: I find myself using this a lot with my food sensitivity clients. I am also a CLT, so it has been an invaluable tool for my clients that did the MRT® test and are on an elimination diet. With That Clean Life, I can filter out foods/ingredients not to be used and I get a database of recipes without them. I also offer a service where I will send a meal plan for a weekly fee. Theresa Montmorency: I include personalized meal plans with my consultation packages. Sending custom meal plans increases the perceived and actual value for the client. Clients are thrilled with how personalized their plans are, the EatLove smart tools and their progress to their goals. Plus, they are willing to pay much more than what I was charging without EatLove. Leanne Ray: I’ve found it to be most beneficial for clients who struggle with knowing where to start with meal planning, prepping, and cooking more. It’s just overwhelming in the beginning! For example, I got a client started with the plans and she cooked exclusively from them in the beginning of our time together. As we moved along, she became more confident and gradually started incorporating some of her own recipes. Now she feels confident enough to do it completely on her own which is such a win for me! The plans also bring in some affiliate income, but I’m more excited about having a streamlined meal planning solution for clients that doesn’t involve me spending hours creating them. Jenna Gorham: I started by bundling them because everybody asks for recipes and I thought it was a great tool to allow them to access the database of healthy recipes. At one point I felt like not everyone was taking full advantage of the plans and not everyone wanted them so I started offering it as an add on tool – this method also worked well. I also had a few clients from other states find me because they were specifically looking for meal plans. I worked with these clients remotely and created a custom meal planning package. We did 1 nutrition assessment and then I customized the plans to meet their needs each week. What is your primary reimbursement model (insurance vs cash pay) and type of practice (virtual or in person)? Amanda Sauceda: I am cash-pay and am mostly in-person. Natalia Stasenko: Cash pay, virtual private practice. Basheerah Enahora: My business is about 60% insurance, 40% cash-pay, from packages, group programs or corporate wellness events. About 70% of my visits are virtual, 30% in person. Sarah Marjoram: I work as a marketing and communications consultant with business clients. Melissa Groves: I’m cash pay only and use a monthly billing structure. I see clients in person in Portsmouth, NH, 2 days a week and virtually the rest of the time. Chloe Schweinshaut: I accept insurance, and although I have a physical office in Harvard Square, I see patients virtually as well. Theresa Montmorency: Most of my clients come from my local gym. I work as a consultant for the gym and work closely with clients to meet their nutrition needs. I meet with the client at least twice. After that, our communication is mostly through email. Leanne Ray: Because 1:1 coaching isn’t my main revenue stream at this time, I decided not to go all in with an office space and billing. My practice is 100% virtual and I only accept cash pay clients. Jenna Gorham: I was cash pay and both in person and virtual. I gained more virtual clients from having the meal plan option. What is one thing you wish you had known before selecting the option you choose? Anything else you wish to share on this topic? Amanda Sauceda: One thing I wish I knew was maybe best practices. I learned quickly the best way to sign up people for the meal plans is include it in their package. Living Plate Rx is more than just meal plans. They have also developed turnkey education programs that you can get custom branded. So much time saved! Plus they also have infographics and handouts that you can also purchase for your practice. Natalia Stasenko: I am generally happy with my choice. I am using it only for a very specific audience and it works well for me. I think we need more meal planning tools for families. Simple meals, easily deconstructed, flexible, taking minutes to put together, minimal cleanup. Most recipes and meal plans are too difficult to follow for families where one or more kids are picky eaters or there is a baby starting solids. Basheerah Enahora: I really wanted to develop my own platform, and had reached out to Gathered Table to see if I could license their technology. However, Jeanne beat me to it. Ha! I love supporting other RDs and I’ve learned a lot from seeing Jeanne’s business grow. In hindsight, it would not have been smart to invest in building my own platform. I wasn’t at the right stage of business at the time and needed to invest more in marketing and advertising to ensure business growth. Living Plate RX is a great tool for RDs to generate incremental income and most of my clients love the platform. Sarah Marjoram: Meal plans are a powerful marketing tool for RDNs. There are several dietitians in private practice that are leveraging them beautifully – adding value to their business while providing a great service to their clients. When I started practicing almost 20 years ago, I didn’t incorporate meal plans into my business. I felt it was more important to educate clients on how to create them for themselves. Fast forward to today where so much has changed for consumers. In my opinion, advances in technology and consumers rising demand for personalized health services make offering meal plans almost a requirement. If consumers demand them, I’d love to see RDNs be the professional that provide them. Melissa Groves: I wish I had known that the recipes are not designed by dietitians. I often have to review recipes for special diets (such as low-FODMAP) to make sure they’re accurate before sending them to my clients. I also wish I knew how difficult it would be to add single foods or packaged foods to the plan – for example, if I wanted a client to have a RxBar for a snack, I’d have to manually add that information. Or if I wanted to add a side of roasted broccoli to dinner, I’d have to create a recipe for that before adding it. It’s somewhat integrated with the USDA database, but it’s difficult to find foods in there. Food tracking apps such as MyFitnessPal® and Fitbit® seem to have a much more updated database of packaged foods. In my experience, everyone says they want a meal plan, but no one actually wants to follow one! I think we’re not quite there yet in terms of a vast library of recipes and healthy meals created by dietitians and sort able by nutrition info, dietary considerations, etc. Chloe Schweinshaut: This program isn’t cheap, but it has absolutely paid for itself and I do really feel as though it has brought my practice to a higher level in that clients are very impressed with the software and menus. Theresa Montmorency: I wish I would have known about the extensive support that EatLove provides. I would have signed up a lot sooner! Of course they were very helpful with answering questions about EatLove and the technology, but the business support that I received and continue to receive has been a blessing for my business. I have spoken with the EatLove team through email, phone, and even FaceTime! Each time they answer my questions thoroughly and even talk me down when I feel overwhelmed with all the fun that comes with being an entrepreneur. The CEO actually helped me to focus and set up goals for where I want to be in the future. It is nice to know that I have a team in the business of healthy eating that I can bounce ideas off of and also give me constructive criticism. It really is a true partnership when you sign up for EatLove. Leanne Ray: This isn’t really something I wish I knew before, but something I like to share with anyone who is considering using a meal planning tool in their practice moving forward. They can be great for generating leads in addition to just offering them to existing clients. Living Plate offers a free 3-day trial and the RD gets notified when someone signs up. It’s a great, natural opportunity to reach out and offer extra support without being salesy, so I would recommend taking full advantage of that and coming up with creative ways to promote it. In full transparency, I do some social media contract work for Living Plate and wanted to disclose this. Jenna Gorham: Nothing! I also really like that Living Plate offers plans for different types of diets – plant-based, and even Low-FODMAP and PCOS now! The process of choosing a custom meal planning tool for your practice can feel complex. Considering your population, strategy for monetization and need for specific features will streamline the process. The insight from RD users of popular platforms presented offers a window into challenges as well as successes of offering custom meal plans. From lists of meal/snack ideas, pantry organizers, portion guides and plate-based teaching tools, RD2RD has tools for use with clients. Learn more about RD2RD and how you could sell your client tools. Create your store and list products for free! Apply to be a vendor. 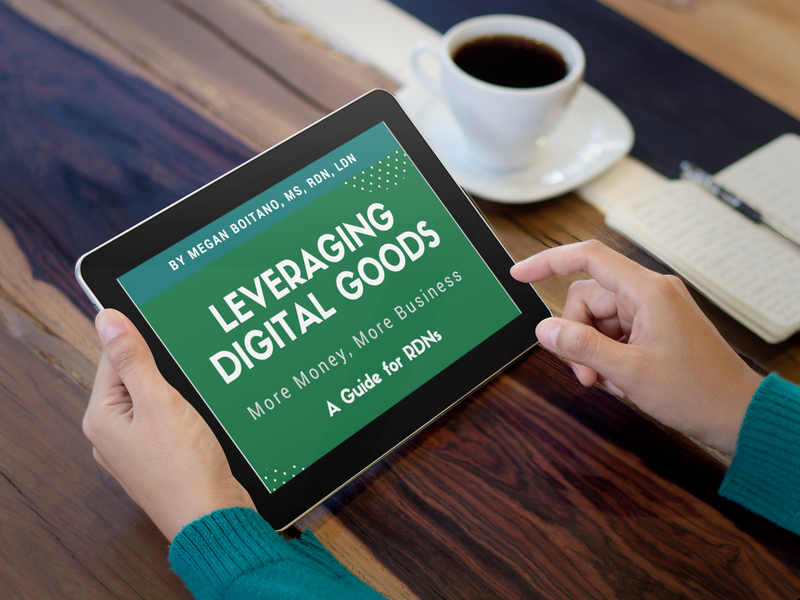 Be sure to grab a copy of my FREE e-book, “Leveraging Digital Goods: More Money, More Business” with a BONUS getting started checklist. Enter your email below! Sales Tax for Digital Products – Are You Compliant?